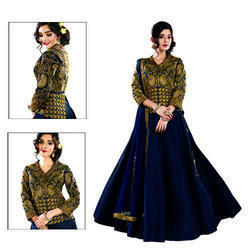 Anarkali Suits that we offer to the esteemed customers across the country also involves, Embroidery Anarkali Suits, Designer Wear Anarkali Suit, White Designer Anarkali Suits, Indian Suit, Designer Party Wear Suit, Anarkali Salwar Suit and many such. 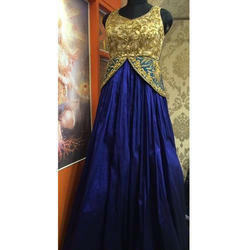 All the offered dresses are designed by our creative designers following orgtanization laid guidelines. Followed by this, demand for our range is increasing at a rapid speed. Party Wear Salwar Kurta is offered by us to clients in wide range. The offered Party Wear Salwar Kurta is available in different colors and designs. We manufactured this Party Wear Salwar Kurta as per the latest fashions and trends. We are the leading supplier of this Party Wear Salwar Kurta. We also customized this Party Wear Salwar Kurta for clients as per their requirements. A gharara is a traditional Lucknowi outfit, traditionally worn by Muslim women of the Hindi Belt. It consists of a kurti (a short, mid-thigh length tunic), a dupatta (veil), and most importantly, a pair of wide-legged pants, ruched at the knee so they flare out dramatically. We are manufacturing a wide range of Chudidar Suits. These Chudidar Suits are available in various sizes. Infusing style and sophistication, our designed Chudidar Suits are known for their flawless finish. Our collection of Chudidar Suits comes in host of several colours, cut and designs to fulfill the demands of different girls and ladies. Designer Anarkali Suit We bring forth to our clients an exclusive collection of Designer Salwar Suit which has a smooth luster. Further, it is beautifully embellished by various designs and patterns. These are creatively designed by our expert designers; make these suitable for different occasions. Anarkali Suit is offered by us to clients in wide range. 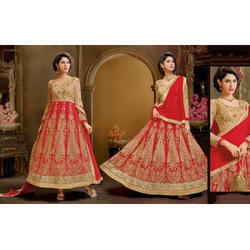 The offered Anarkali Suit is available in different colors and designs. We manufactured this Anarkali Suit as per the latest fashions and trends. We are the leading supplier of this Anarkali Suit. We also customized this Anarkali Suit for clients as per their requirements. Redefine the fashion with this innovative piece of handcrafted embroidered suit. The fabulous Salwar Kameez is adorned with intricate carving and sequins that adds a unique spark to the attire. With our aim to satisfy our clients, we are engaged in offering a wide range of Anarkali Suit all across the market. These products come with a very smooth and a fine finish to make them comfortable than never before and ensure long lasting wearing life. These are available in soothing colors and elegant designs as per the client’s choice. Last but not the least, we are offering our entire range at most reasonable rates. We have varieties of Anarkali Suit long 48 length anarkali with stone work and broad border in demand these suits are available from us i varieties of sizes. Client can direct contact us for more details. sizes in regular and xls. These suits are available at most competitive price. Yellow designer suits launched by us to to client in wide range.we offering the embroidery designer suit in diffrent colors and designs.We design latest and trendy designs by us to our cleints.We also design the product as per the client requirement. Designer Lehenga Choli We bring forth to our clients an exclusive collection of Designer Lehenga choli which has a smooth luster. Further, it is beautifully embellished by various designs and patterns. These are creatively designed by our expert designers; make these suitable for different occasions. Fancy Anarkali Suit is offered by us to clients in wide range. 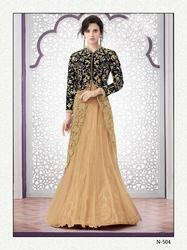 The offered Fancy Anarkali Suit is available in different colors and designs. We manufactured this Fancy Anarkali Suitas per the latest fashions and trends. We are the leading supplier of this Fancy Anarkali Suit. We also customized this Fancy Anarkali Suit for clients as per their requirements.